Are you making yo ur life count? Mik and Heidi Sands Gusenius ’03 ’03 are – and in more ways than one. Mik and Heidi have fully committed themselves to two organizations close to their hearts – Gustavus Adolphus College and the Leukemia & Lymphoma Society. 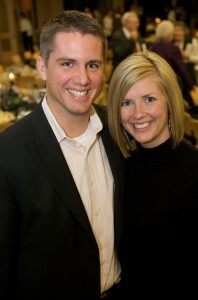 Not long after graduating from Gustavus, Mik and Heidi were married in 2004. They were like any young, newly married couple, just starting out in the world with their whole lives ahead of them. However, in July of 2005 their lives were forever changed, as Heidi was diagnosed with leukemia. After a hospital stay and rounds of chemotherapy, Heidi completed her treatment in January 2006, and is still in remission today. According to Heidi and Mik, this is largely due to the efforts of the Leukemia & Lymphoma Society and the advances made in blood cancer research and treatment. While Heidi’s personal battle with leukemia may be over, her battle to find a cure is not. The past four years both Heidi and Mik have participated in the Team in Training® (TNT) program, which is a fundraising group for LLS. Teams train for and participate in long-distance endurance events, while raising money to fight leukemia, lymphoma, and myeloma. Last year they both competed in the Lifetime Fitness Triathlon and raised more than $10,000 for LLS. This past September, Heidi completed the Irongirl Duathlon held in Bloomington, MN, and Mik raced in America’s Most Beautiful Bike Ride (a 100-mile Century Ride around Lake Tahoe) in June. Their goal this year was to raise $10,000, which they met and beat, with $10,700 raised thus far. Over the last four years, they have raised $47,000 to help fight leukemia. Furthering her commitment to the cause, Heidi recently joined the Leukemia & Lymphoma Society as a Senior Campaign Manager for its Light The Night program. Even though Mik and Heidi are “GOLD” alumni (Graduates of the Last Decade), they are committed members of the Annual Fund’s Ren Anderson Society. To make their gifts more manageable, they give a portion of their total commitment each quarter. In order to recognize other substantial gifts, particularly from younger alumni, the Gustavus Annual Fund has created two new giving societies: the Old Main Society, which acknowledges gifts between $500 and $999, and the Black & Gold Society, which recognizes gifts to the Fund ranging from $250 to $499. Any gift to the Annual Fund can be scheduled according to each donor’s wishes: monthly, quarterly, biannually, etc. Another way to maximize your gift, or make your dollars stretch, is to check with your employer to see if they have a matching gift program. Visit gustavus.edu/giving to make your life count. For more information on Team Gusenius, visit pages.teamintraining.org/mn/irongdua09/HeidiGusenius.